In the first part of this look at magma chambers, I talked about some of the processes that dominate what goes on beneath an active volcano. The twin actions of fractionation and assimilation were what preoccupied the early researchers, however more recently we've realised things are a little more complicated than that. In this part I want to take a closer look at some of those intricacies. As I mentioned in the first part, Skaergaard drove much of the early research. While its simplicity allowed easy interpretation of its magmatic history, people began to imagine all magma chambers were like that. The classical view of magma chambers was that they were something tranquil, slowly evolving to high silica contents. It was assumed that, given estimated magma supply rates suggest that the largest silicic eruptions must take hundreds of thousands of years to produce, that magma chambers would just sit there fractionating for all that time. The long-lived nature of large, silicic magma chambers has been confirmed by looking at the age of zircons found in the erupted products. Zircon crystal are usually small, and make up only a tiny percent of the eruptions they are found in. However, their high melting temperature means that once they crystallise, they tend to stick around. Individual crystals can then be dated using radiometric dating. Zircons found in large eruptions, like the 100 km3 eruption of Kos, Greece and the 530 km3 eruption of Taupo, New Zealand have zircons over 100,000 years older than the age of the eruption. However, when we run computer simulations of cooling magma chambers, we find that actually they would cool much quicker than that. One way of getting round this problem is to supply the chamber with heat, and one way of doing this is by supplying the chamber with fresh, mafic magma from depth. While this didn't occur in Skaergaard, examples of this happening are common. Enclaves or inclusions of mafic melts are often found in both the erupted products (lavas and pumices) and in once-buried plutons, like those seen in the photo below. Mafic recharge of magma chambers under volcanoes is now considered ubiquitous, and is one of the possible triggers of eruptions. The layers found in many plutons, like the mafic ones found on the Isle of Rum, Scotland, show how they were assembled incrementally by successive influxes of magma. Dark mafic enclaves is a lighter granite. 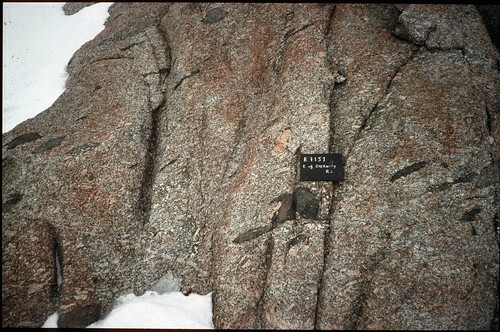 This example from the Eternity Range, on the Antarctic Peninsular. Photo from Flickr, CC BY-SA by euphro. A larger problem is we just can't find many magma chambers. When we start looking for magma chambers with seismic surveys, we can't see many. These surveys use the time taken for seismic waves to reach a receiver, either from earthquakes or artificial sources, to work out the structure beneath our feet. A large volume of molten rock would show up clearly, and there should be many such large volumes if molten magma chambers are long lived. In the last 10,000 years there have been at least 50 eruptions of VEI 6 or above, that is eruptions that released at least 10 km3 of magma. Assuming that this rate is typical, and that magma chambers last for tens to hundreds of thousands of years, so there should be hundreds of examples around the world. So where are they? The solution to this apparent paradox is perhaps the biggest recent change in the way we think about magma chambers. Before, the assumption was that they remained molten in between eruptions. But that doesn't have to be the case, and in fact closer examination shows that it probably isn't the case for most large systems. Our current working hypothesis — our current best model — comes from a paper by Wes Hildreth and Colin Wilson on the Bishop Tuff eruption. 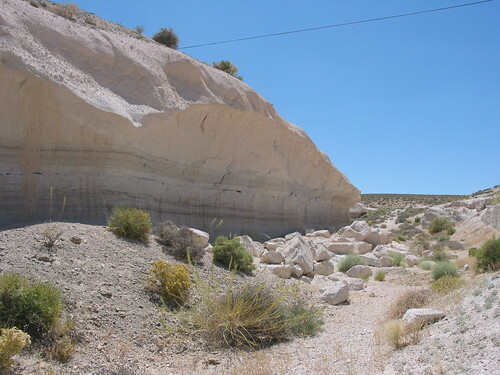 The Bishop Tuff is the deposits from an eruption that produced at least 600 km3 of magma and created the Long Valley Caldera in California about 760,000 years ago. Over several decades Hildreth and Wilson have reconstructed the order in which the various deposits were erupted, which is no mean feat considering that they reach up to 200 km from the source. Ash was also deposited over 2.5 million km2! They used this, along with information on the smaller eruptions which preceded it, to try and reconstruct the magma chamber form which it sprung forth. The Bishop Tuff. Photo CC BY-NC-SA by Ron Schott on Flickr. A generalised version of the conclusions they came to is shown below. Their version for the Bishop Tuff has many details specific to that eruption only, however there are many general features that likely apply to all silicic magma chambers. The conclusion they came to is that rather than have a liquid magma chamber slowly crystallising, it is more often you have a crystal mush from which melt is extracted. Sketch showing the general features of a magma chamber. Not to scale. Each time a new batch of magma is injected, it cools until it becomes a mush. Through compaction, or similar processes, the remaining melt is extracted. Rather than the image of fractionation occurring as crystals are removed from the melt that we get from looking at Skaergaard and other mafic magma chambers, for silicic chambers we get the opposite. The melt is removed from the crystals. Mushes are not easy to see on seismic surveys, explaining why we don't see many magma chambers. Magma can be stored as mushes for long periods, explaining the long crystal residence times. Kept warm by repeated mafic replenishment, these mushes would likely to be easy to reheat and 'defrost', quickly creating the large volumes of magma found in huge eruptions. Occasionally the mush itself can be erupted as 'monotonous intermediates', massive eruptions that produce very monotonous products, intermediate in silica content and with very high crystal content. The largest known of these, the Fish Canyon Tuff, is over 5,000 km3. It turns out that the large volumes of molten magma that form these eruptions, far from being long-lived features like it used to be assumed, can actually assemble very quickly. How quickly, and what causes them to be assembled, is still to be discovered. The third part of this post will investigate this.